As Low As $2.70. When 10% store discount is applied. 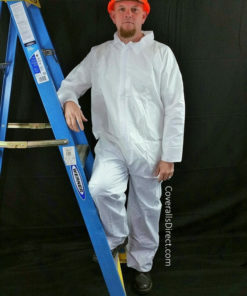 Coverall with Open Wrist and Ankle. Suitable protection against non hazardous particles, light liquid splash, and aerosols in many industrial applications. Sold per each. For every 25 bought, will ship as a case. As Low As $2.93. When 10% store discount is applied. 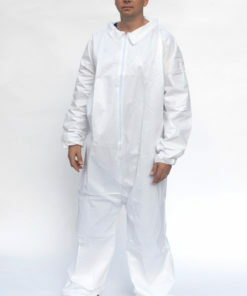 Coverall with elastic Wrist and Ankle. Suitable protection against non hazardous particles, light liquid splash, and aerosols in many industrial applications. Sold per each. For every 25 bought, will ship as a case. As Low As $3.15. When 10% store discount is applied. 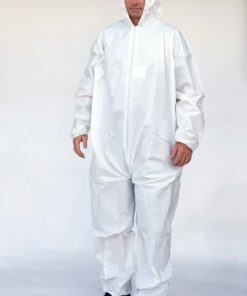 Coverall, Zipper Front with Hood, Elastic Wrists & Ankles. Suitable protection against non hazardous particles, light liquid splash, and aerosols in many industrial applications. Sold per each. For every 25 bought, will ship as a case. As Low As $3.38. When 10% store discount is applied. Coverall with hood, boot, and elastic wrist. Suitable protection against non hazardous particles, light liquid splash, and aerosols in many industrial applications. Sold per each. For every 25 bought, will ship as a case. 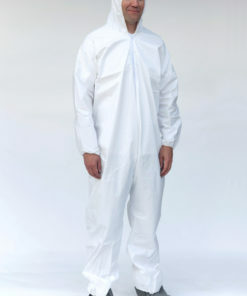 Suntech Microporus Film coveralls, lab coats, aprons, sleeves are suitable protection against non hazardous particles, light liquid splash, and aerosols in many industrial applications. Available sizes: Small, Medium, Large, XL, 2X, 3X, 4X Made with micro-porous film that is laminated in spun-bonded polypropylene. Ideal for a broad range of non-hazardous applications including paint spray, dirt, fiberglass applications, general cleanup, automotive refinishing, waste cleanup, pressure washing, remediation, non-hazardous liquid handling, tank cleaning, and printing.